» IMNS Seminar: Dr Sara Ghoreishizadeh "Integrated circuit and system design for next-generation multi-analyte sensing devices"
IMNS Seminar: Dr Sara Ghoreishizadeh "Integrated circuit and system design for next-generation multi-analyte sensing devices"
Next-generation implantable and wearable medical devices are emerging to address specific unmet healthcare needs, particularly those in medical monitoring and diagnostics. Monitoring of analytes (e.g., glucose, lactate) in human body is of significant importance in health-care and personalised therapy. In this talk, I will present our sub-mW CMOS IC that enables the fabrication of miniaturised, inductively powered, and implantable devices for multi-metabolite detection. Next, I will illustrate a novel differential sensing technique to enhance the electrochemical sensing performance. I will also present promising results from our sensors that are developed, for the first time, by growing Pt nano-structures on CMOS IC. Despite remarkable advances in electrochemical sensor design, the constant need of the sensors for calibration remains a barrier to their diagnostic potential. I will briefly discuss our latest results showing how electrochemical impedance spectroscopy (EIS) may be used to auto-calibrate the sensors. In the second part of the talk, I will present an on-chip interface for recovering power and providing full-duplex communication over an AC-coupled 4-wire lead between active implantable devices. 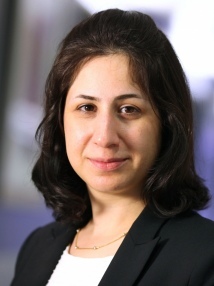 Dr Sara Ghoreishizadeh received the BSc and MSc degrees (both with distinction) in Electrical engineering from Sharif University of Technology, Iran, and the PhD degree from Ecole Polytechnique Federale de Lausanne (EPFL), Switzerland, in 2015. She then joined the Centre for Bio-inspired Technology, Department of Electrical and Electronic Engineering, Imperial College London, UK, where she is currently a Junior Research Fellow. Her current research focus is integrated circuit and system design for implantable and wearable medical devices for diagnostics. She has published more than 25 papers on various aspects of such devices. She is an editor of the Journal of Microelectronics and an elected member of the IEEE BioCAS technical committee. She has served at multiple IEEE conferences including ICECS 2016-18 and BioCAS 2017-18 as technical committee member and technical session chair. A pizza lunch will be served at 12:30 and the talk will run from 12:45 - 13:30.